In case you hadn’t already guessed, Emily and I love camping (last year we even got to camp together in Tofino!). I love sitting around the campfire, I love s’mores and spiked coffee, I love pancake breakfasts. I love waking up in the forest with that fresh forest smell. I love walking on the beach, swimming in lakes, day hikes, camping quesadilla night, all of it! My knits always come back with a hint of a campfire smell to them, but I really don’t mind. British Columbia is a beautiful place and every summer I like to hit the road, family in tow, and camp out in a little piece of it. 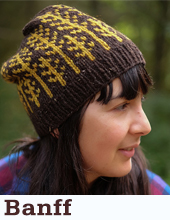 SO, when I first saw Tolt Yarn and Wool’s Camp Tolt, I was instantly in. Last year we created the Banff hat for the collection and it quickly became a fan favourite. Simple fair isle creating a charming tree line hat, in our classic size range of course, in case you and your kiddos need to match (and we definitely think they do). I always love the photos Anna and Claire send me of the knits. They remind my of camping as a kid, because some things really don’t change! There is always debate around the campfire among family and friends whether the best s’more is a toasted marshmallow sandwiched between 2 graham crackers with a square of chocolate hiding in there somewhere, OR a graham cracker/marshmallow/chocolate sandwich, wrapped in tinfoil and warmed on the coals all together. I’m not sure there is a wrong answer when it comes to s’mores though…. I’m also pretty excited for the invention of graham crackers that come pre-chocolated, that’s a game changer! So, what project do you pack for your summer adventures? 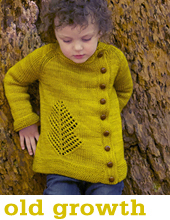 Are you a sweater knitter who packs a body and some sleeves? Maybe you like to knock out a hat on the way to the campground? 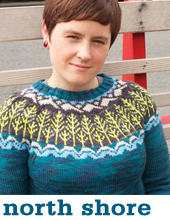 ← Postcards from Alaska Part 2: The Knitters! Love the mitts, but as an ex-pat soon to be returning to Canada, I want to contribute to the s’mores debate. I would probably avoid pre-chocolated graham crackers, because they’d have to be milk chocolate and I prefer dark. Good idea, though. I’m of the toasted marshmallow camp, but I always melt the chocolate onto my graham crackers while I’m toasting. The trick is to find a hot log or rock near enough to the fire that the chocolate will melt, but flat enough that the risk of losing the whole thing to the fire is minimal. Can’t wait to take my kids camping next summer! I thoroughly enjoyed your well thought out contribution to the s’mores debate! Dark chocolate is also my fave!